Studying fluctuations in biogeography–or the distribution of species and ecosystems–has been an effective alternative to viewing real life effects of climate change in short time scales. Although there is a large volume of research on the biogeography of animals, there is an inadequate amount of study into the change of forests despite vast amounts of data and the ability to check for age distributions, environmental effects or stressors. Zhu et al. (2014) assert that studying forest biogeography is important because species often fulfill different niches dependent on their life stage. Most models of species migration assume that juveniles and adults have the same environmental requirements, but by studying different life stages of trees, these models might prove inaccurate. One untested theory is that as temperature and precipitation increase, juvenile trees will develop rapid growth, increased mortality, and increased recruitment. 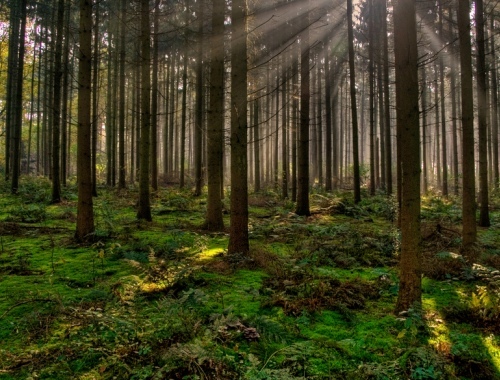 This study found that forests in the Eastern United States have increased turnover rather than migrating North as a result of climate change suggesting that climate models need to be modified. Zhu and his colleagues at Duke University modeled their study differently than previous approaches which allowed them to develop hypotheses of biogeography. Their main change was that they jointly analyzed juveniles and adults to understand the interactions that contribute to forest distributions at large scales. Assumptions prior to this study dismissed juvenile niche requirements on the grounds that where there are adults now, there were once juveniles. Although this is true, this fails to realize the accelerating dynamic environment induced by climate change. Also unique to their study, the authors did not model all observations. Rather than including non-zero values where there were no trees, the authors only included positive values to simplify the model in order to view abundance changes within the range along climate gradients. The rest of their research was done by combining forest inventory data from the Forest Inventory and Analysis (FIA) program of the USDA Forest Service and climate data from the 800 m resolution Parameter-elevation Regressions on Independent Slopes Model (PRISM) data set. The data were modified so that the plot scale of the FIA could be translated into an aggregated eco-regional scale. By doing so, this aligned the two different data sets of climate and species abundance, which gave more accurate results. The authors tested the validity of the eco-region level model by running both the modified data and the original plot-level data through the models and regressions. They found that the plot-level data, as hypothesized, did not provide statistically significant data and did not provide any insight into the results. The calibrated eco-regional data provided two distinct sets for juvenile and adult trees of the 65 tree species analyzed. Within one species, Pinus taeda, juvenile and adult tree abundances are high in warm and wet climates. Using equations for their models, the authors were able to identify the optimal climates for both the juvenile seedlings and the mature adults. The optimal temperature and precipitation was ultimately higher in seedling surface response than the adult tree. In this case, the author’s hypothesis of turnover is supported because juvenile trees have higher optimal climatic conditions (warmer temperatures and more precipitation) than the adult. This was also supported by the high ratio of seedlings to adult trees in warm and wet climates. The majority of the species in the sample displayed similar results. In the case of a few tree species like Ilex opaca, the abundance of seedlings and adult trees was higher in more moderate climate conditions. The equations also showed that the seedlings had lower optimal climatic conditions (cooler temperatures and less precipitation) than the adult trees. In this case, the migration hypothesis is supported. Although there are these few outliers, the turnover hypothesis is predominately supported by the optimal temperature and precipitation comparisons between seedlings and adult trees. These results challenge previous assumptions of niche conservatism through species life history stages and calls for re-examination of modeling methods of forest migration, if not for animal species as well. There are more studies that have yet to be done like the different effects that might occur between early vs. late successional species. This entry was posted in Cortland Henderson, Reforestation, Uncategorized and tagged Climate change, Forest Management, Species Migration by Emil Morhardt. Bookmark the permalink.